Pocher K74 1935 Mercedes 500K-AK Cabriolet 1/8 scale model kit! 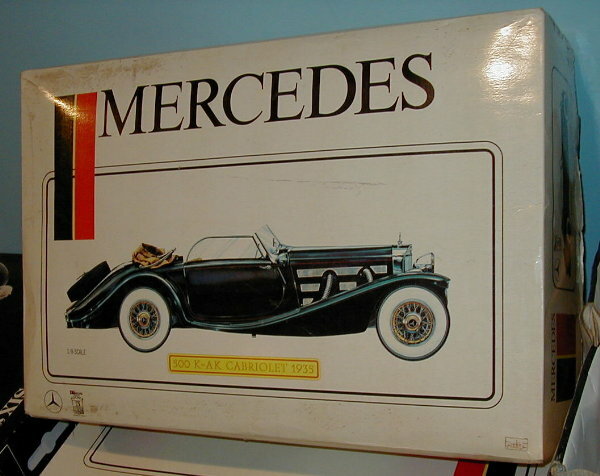 This is the first edition of the lovely Pocher Mercedes model. There are a few extra parts here in the steering and suspension that are removed in the later editions. Of course, this edition has the wire wheels that some people are fond of. Here at The Modeller’s Workshop we feel the spokes are thin for the size of the tyres so we make sure the wheels are painted on the larger models. The wires are perfect for the Alfa model but it seems Pocher did not think of using a thicker wire for the Rolls Royce and the Mercedes. We have several of these kits in stock and we also buy and sell this kit regularly. Please check with us for the condition of the kit we currently have in stock.